Concentric plc. has opened a new purpose-built factory in Pune (formerly Poona), India where it will manufacture and assemble oil and water pumps for medium and heavy diesel engines. 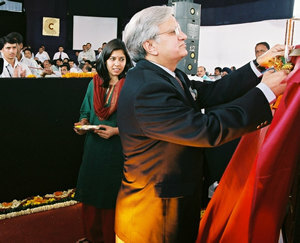 The new plant was formally opened by Ravi Kant, Chairman of Tata Cummins on Wednesday 2nd March with traditional Indian ceremony. Customers, employees and suppliers were welcomed by Ian Dugan, Chief Executive of Concentric.plc, Mike Attwood, Director and M. Krishna, Managing Director of Concentric Pumps (India) Pvt. Ltd. Total area of the new complex, including the administrative block and factory buildings, is approximately 60,000 sq.ft. with an additional area of 40,000 sq.ft earmarked for future expansion. It is equipped with a wide range of modern CNC equipment, including 14 lathes, 15 vertical machining centres and four special purpose machines. All assembly and test stations are automated or semi-automated and poke yoked, while the whole plant benefits from a total preventative maintenance and continuous improvement regime. The new plant replaces the original and smaller factory nearby. Ian Dugan commented: "Since 1999, when we commenced operations in India, we have built many good relationships as well as considerable experience of local conditions. The time is now right to build on that experience and make the benefits more widely available to our customers round the world. We are confident that the new factory will deliver quality equal to anywhere in the world at a price that will be attractive in every market." Concentric plc is a major supplier to the world's truck and construction equipment industries with plants in the UK, USA as well as India. In addition to oil and water pumps for diesel engines, the group also manufactures, lubrication pumps for transmissions and compressors, fans, impellers and associated equipment. Following the opening of the new Indian facility, Concentric Pumps will continue to manufacture at its other strategic locations in Birmingham, UK and in Itasca, Illinois, USA. In addition, Birmingham will remain the group centre of excellence for design, development and engineering.